RE:Worx can be contacted by any of the following methods, so please don't hesitate to get in touch! Our friendly Portsmouth-based Workshop (located a couple of miles off the A27/M27/M275) is open from 9.00am until 5pm Monday to Friday. 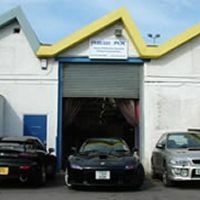 We can often be found at the workshop after hours and on Saturdays too, enabling us to cater for customers who are unable to drop off and collect their cars within normal office hours (please note however that this service is provided strictly at our discretion and by prior arrangement only). E-mail is our preferred method of contact; it gives us time to look out what you are after and finish whatever we are in the middle of - and avoids us trying to understand what it is you are after whilst a car is being power-run on the dyno. It also helps direct enquiries to the right people with minimal effort. Please use parts@reworx.com for all parts enquiries, OEM Mazda and aftermarket, and servicing@reworx.com for all workshop requests including servicing, engine building, tuning and dyno enquiries. If you are a trader contacting us please use trade@reworx.com for all enquiries. We endeavor to respond to all e-mails with 48 hours but please be patient during busy times - your enquiry IS important to us. Map: You can find our general location using this Multimap link. If you are still having problems please call us when you think you are close!